This is a vertically and horizontally polarized antenna the Linear loaded 1/4 wave length vertical radiator introduces very little loss. The over all radiation efficiency is high at 80% to 85%. Enhancing this vertical radiator is the 1/4 wavelength horzontally polarized radiator (counterpoise) Located at the feed-point an note it is at the top of the antenna giving you a almost Totally Omnidirectional pattern of high wave angle horzontally polarized Radiation. You will be quite amazed with how well this antenna works on either 80 or 160 meters. When I designed this antenna I addressed all the pitfalls of traditional designs. Traditional low band antennas have numerous problems No. 1 most traditional verticals are based fed. This puts the majority of your power at or near ground potential. With this design all of the current is at the top of the antenna. Traditional verticals rely heavily on ground radial systems. Most verticals operate at less than 50 percent efficiency. On 20 meters and above. And less than 20 percent efficiency on 40 meters and below. Even if you have elevated ground radials most of your current is still near ground potential. A standard half wavelength horizontal dipole operates at ninety-eight percent efficiency. If you could stand this antenna straight up where it was vertical. It would still operate at ninety-eight percent efficiency. Now of course an antenna like this would be way too tall. for most people to put up on 40 m and below. But if it was only 1/8 or 1/10 of a wavelength tall then it would be more feasible for most people. That is how my antenna design works. But of course if you only transmit a vertically polarized signal then you will not be able to talk to stations that are less than 200 miles away with good signal reports. So my design transmits both horizontal and vertical component. This gives you even illumination at all take off angles. So it makes no difference rather you are talking to someone 5 miles or 5000 miles away. Because the antenna is based upon a half wavelength dipole it does not need any ground radial system. Because the vertical radiator is linear loaded it adds additional capacitance reactance to that element. That is why the vertical element is longer than the horizontal element. The additional wire on the vertical element ads back the missing inductance reactants to the antenna system to make it resonant. It also off centers the feed point this raises the feed point impedance back to 50 ohms. The linear loading only lowers the efficiency of the antenna about 13 percent. So with 100 watts input you get 87 Watts of effective radiated power. The tower or mast can be metal or nonmetallic. It really does not matter. The spacing of 18 inches from a metal tower or mast Is all that is required to isolate the antenna from coupling to it. 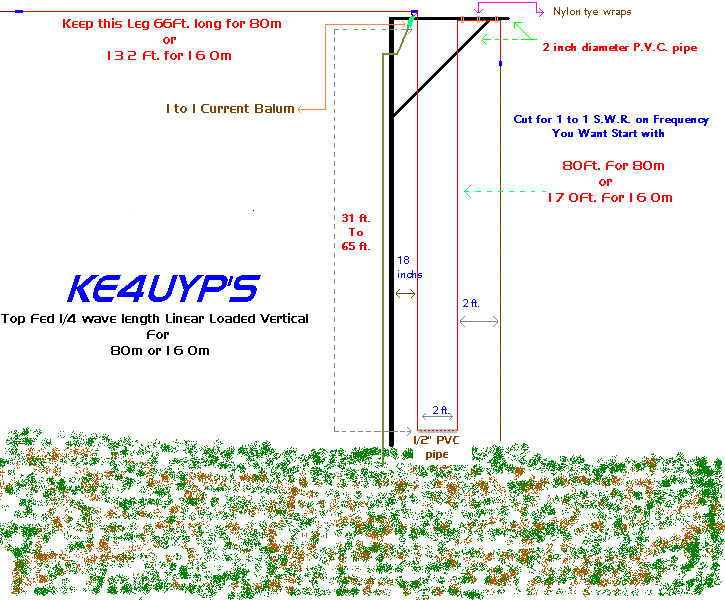 The total height of the linear loaded vertical section can be as short as 15 feet on 80 m. 25 feet is optimum. Or 32 feet on 160 m. 52 feet is optimum . The Short-ter heights will lower the efficiency a little but only just a few percent. The only significant difference is to take off the angle it is a little higher. But it is still measurably lower than a horizontal dipole at a quarter of a wavelength off the ground. So you still will see a lot of improvement on DX'ing. When I first conceived this design my first model was on 10 meters, it was four feet off the ground at the very top, and the antenna its self was three feet tall. I made the antenna with 28 gauge wire the spacing was two inches. My first contact was to Anchorage AK I got a signal report of 5/9, my next three contacts were in to Europe Germany-5/9 +10db and Belgium 5/9 +5db .I knew then I had a winner, so then I built the first full scale model on 160 meters. It was 52 feet in length and 65 feet to the top of the antenna, the first night I went on the air I was running just 100 watts and no one would believe me, a couple of the operators insisted that I was running a amplifier. Let me warn you in advance Adjusting this type of an antenna is no picnic. There is no exact science because there is several variables that are not known the most obvious is how much reactance will the tower contribute. Most of the time it is in the form of capacitance but not always, so there is no exact dimensions for the vertical portion of the antenna, that is why I say start with 80 feet for 80m and 170 feet for 160m then cut the end of the vertical wire and look for resonance. If you are using a MFJ analyzer or a SWR meter they will only measure at 50 ohms. Unfortunately the height above ground dictates the radiation resistance of the antenna and ground quality will vary this even further. This will have a major impact on the feed point impedance a little trick that you can do to speed the process along is this. Take a SWR measurement by sweeping across the band. What you are looking for is a dip on the meter when you find this you should be able to see it start to go up when you move to either side of that frequency it does not have to be very low it will probably be just below 2:1 SWR. or possibly 1.5:1 SWR. Make note of that frequency this is the resonance frequency of the antenna. Obviously if that frequency is too low for you, the antenna will have to be shortened or if the frequency is too high God forbid lengthened. If the frequency is lower than you want then you are in good shape all you'll have to do is to start slowly shortening the vertical element this will do two things. It will raise the resonance frequency and at the same time it will raise the input impedance backup to 50 Ohms. On the other hand if the resonance frequency is too high then both the horizontal wire and the vertical must be adjusted exactly the same. For example six inches longer for both the horizontal wire and vertical wire. Here is a little trick to calculate how much longer or shorter to make the antenna for the frequency you want. Take the length of the antenna multiplied by the frequency that it is at right now. Then take the answer and divide that by the frequency that you want. This answer will be the length of the antenna in feet for the frequency that you really want.